Don't you love a bargain? I sure do. In fact, in my adventure chronicled in the book Between A Clutch and a Hard Place, I latched onto the tail of a mystery in a consignment shop. See, I'd gone to the consignment shop because Tansie came over to my house bragging about a pocket book she'd bought at the shop. I was a tad surprised at Tansie for admitting she'd gone to what amounted to a secondhand store, what with her always throwing money around like it was confetti. Still, it was a cute pocket book, so I went down there to see what I could find. I walked in, and wouldn't you know it? I laid eyes on the cutest little black purse. The saleslady called it a clutch. There was a pretty pair of black pumps sitting next to that clutch, and it was just like they were all meant to be together. So, yes, I bought the shoes too. Now please don't go being like my daughter and saying that I'm too old for high heels. I love them, and just because I'm in my early sixties, I'm not about to give them up! Anyhow, I came home and opened up that clutch to see how good of a deal I'd got. Well, inside there was a note from somebody named Flora Adams. She said that if anything happened to her to look to Jim. Naturally, I had to find out what happened to Flora Adams and whether or not Jim had anything to do with it. My story--and six others--are available for a measly little old ninety-nine cents. Can you believe it? Tansie might even get her sister and all of the women in the M.E.L.O.N.S. one since they're so cheap. By the way, the M.E.L.O.N.S. are Mature Elegant Ladies Open to Nice Suggestions. The group was Bettie Easton's idea. I told her it made us sound like old hookers, but she said we're only open to nice suggestions. Whatever. They serve good food, and I like to eat so I go. So, how about you? What's the best bargain you ever got? 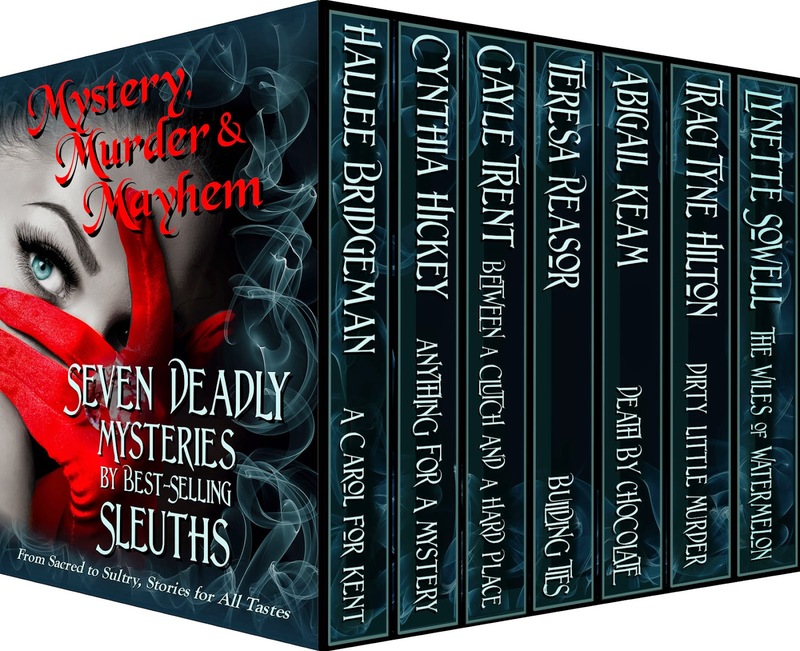 Mystery, Murder, & Mayhem Collection: Seven Deadly Mysteries by Best-Selling Sleuths [Kindle Edition] is now available for pre-order. i preordered! it sounds wonderful! My Brother had to downsize to a small apartment and we had to give our Moms giant antique dining room table set away. Although heartbroken we had no choice as we both live in tiny places. . I felt terrible so I thought I might pop into Goodwill every day until I found a suitable replacement. I walked in to my local Goodwill that first day at closing on 50% off day and there was a gorgeous shabby chic white round wood table with a pedestal bottom and 4 matching chairs. It was marked down fifty percent so I got the 5 pieces for 40! It even had a rocking chair in the store that matched so I bought that to for 20. It was a fabulous find and to this day he adores his new table that fits perfect in his new apartment. I saw one on Craigslist in our area a few months later for 600! I am thrilled with the deal to this day. As far as Books, my local used bookstore gives me 50% cover on all my paperbacks as credit, I went on my Birthday and found out I had 50 I n credit and I found some fabulous books. You got a great deal! Couldn't preorder, ever since my debit card number was stolen a few months ago, I only use gift cards to buy on Amazon.